The town's oldest war memorial commemorates the twenty-four 'Townsmen of Tonbridge or Old Boys of Tonbridge School' who died in the Boer War. It stands between the riverside walk and the wall of Tonbridge Castle. Armistice Day Services were held at this memorial until the early 1950s when the memorial was removed following the opening of the new Memorial Garden near the river in Bradford Street. The names of those who died in the first World War were transferred to the wall in the new Garden. Details of almost all the Tonbridge men who died in World War I are here. Seven years after the end of World War II, the garden of remembrance situated between the Medway and the Bradford Street car park was dedicated by Canon Russell White 'in grateful memory of the men of this town who died in the service of their King and Country'. Its focus is the Memorial Wall on which are inscribed the names of those who died. Some 200 relatives of those whose names are inscribed on the Roll of Honour were present at the dedication of the Memorial Garden. A new memorial stands in the High Street on the north side of the river. 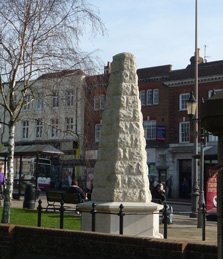 It was dedicated by the Bishop of Tonbridge on 11th November 2004, and is not intended to replace the existing memorials, but to commemorate, in a more prominent position in the town, all those who have lost their lives in service of the community in peace as well as war. The memorial was created by Tonbridge sculptor Peter Hills and bears the words 'In proud memory of all Tonbridge men and women who have given their lives in serving our community during war and peace'.